Thank you to all who joined us for the 62nd meeting of the UN Commission on the Status of Women, March 12-23, 2018, in New York City. Check back here for updates and follow up! The Women’s Intercultural Network (WIN) will share highlights from our delegation to the 62nd Commission on the Status of Women United Nations 2018 Convention focused on Rural Women and Girls. Join us at the lovely, woman owned bar and restaurant, Asiento, in the heart of the Mission District in San Francisco. Purchase a cocktail, delicious snack or meal, connect with friends and meet new people for an hour. Hear the engaging stories from WIN and perhaps win lunch with Roma Guy, guitar lessons, job coaching and more. Our banner is who we are – women and girls bridging cultures, creeds, classes, ages and gender preference.WIN’s mission is to assure that all women and girl’s voices are heard in public forums for full participation in their governments and economies. Women’s rights are human rights. There is no cost to attend, and the event is open to public. 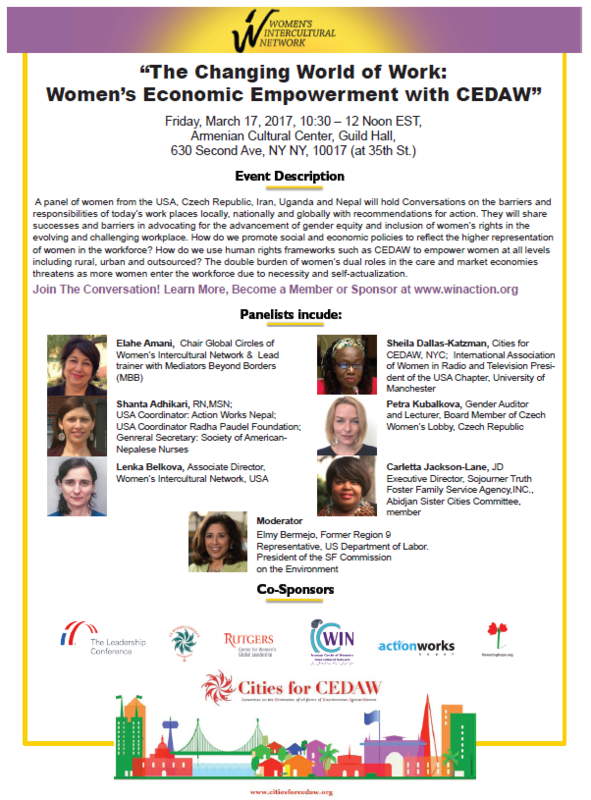 You can register to attend NGO CSW Forum events on this website. That’s where the action will be! Your voice counts! It will be filmed and tweeted. Check back here for updates on the 25 year follow up to the Beijing Platform for Action.